Today we bring you this beautiful set of Poppy notecards from illustrator Cindy Lindgren! Poppies are nostalgic in the sense of their history not only in gardens and in textile designs but in their association with Veterans. They seem to say, "Remember me." 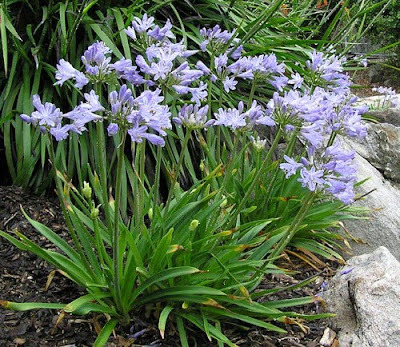 Their distinctive flower head is easily recognizable and hard to forget. There are 2 designs in the set, one of a red and orange Poppy trio and one of an orange and cream Poppy pattern, both drawn in a flat graphic style. These notecards are 5-1/4" x 3-3/4" printed on a high quality uncoated stock with a matching white envelope. They are blank inside so you may add your own message. They are individually packaged in acid free sleeves. These would make an excellent gift, or an elegant addition to your stationery collection. 7. Become Cindy's Facebook Fan. Comment back here with your Facebook name. Existing fans just leave your Facebook name here. Contest ends Saturday, February 13, at 12:00 noon Central. One winner will be chosen by Random.org. Meet Regan Saunders. Regan lives in South Minneapolis near the Institute of Arts with her husband and hamster Ziggy. Her immediate family is all in Minneapolis as well. She works part time at a paper store and also as a valet. Valeting used to take up 5 nights of her week but she's recently changed companies so that she can spend more time on her Etsy shop. You can find Regan on her Etsy store, Regans' Brain. 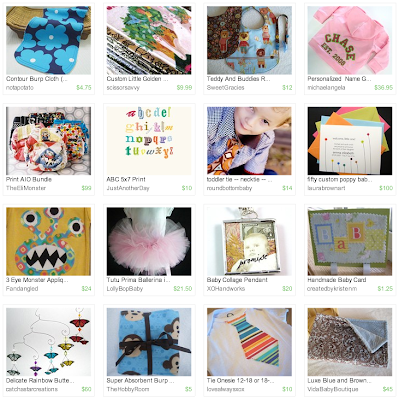 Pillows, Paper goods, Headbands, and Vintage Items - Anything my "brain" comes up with! Mainly from my husband, but really everywhere. I usually walk into a store, see something that grabs my eye and think, "What can I do with this?". Odd objects tend to interest me most and get my wheels turning. My favorite recent purchase is a faux fur Fox figurine! I have a sewing room in our apartment. I use a sewing table that my grandma recently gave me. It was one of the collapsible sewing tables that my great-grandpa used to sell. I've been crafting as long as I can remember. My earliest memories of crafting go back to when my Mom, Dad, Sister, Grandparents and I used to spend a week at a cottage on Lake Minnewaska every August. I remember going to the local Ben Franklin and getting beads, yarn and other goodies. We would sit around making things throughout the week. I always loved the time we spent together and I know it influences me to this day. Currently I am taking my second photography class at the U of M. I also make things while working at the paper store. For fabric I love Craftyplanet in North East - they are also online. Currently I buy a lot of my supplies at JoAnn Fabrics, The Paper Source and Paper Depot, but I am always on the lookout for local shops that have odds and ends. Nothing. Seriously! 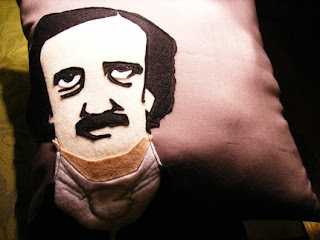 Somehow someone picked up one of my pillows and put it on their blog. 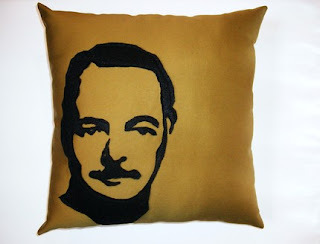 It was then re-blogged on multiple blogs, tripling the views I received on that pillow in one day! That was sort of a fluke, and I wish I knew of good ways one could promote their shop. I am hoping to learn a lot about promoting my shop from other HandmadeMN members! 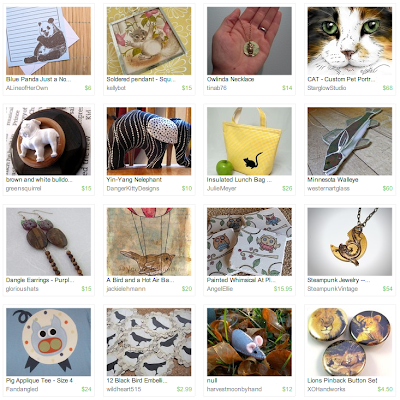 missbrigette's shop - She is responsible for my avatar! Today we bring you these great little flower bobby pins from Dana of wynzia! 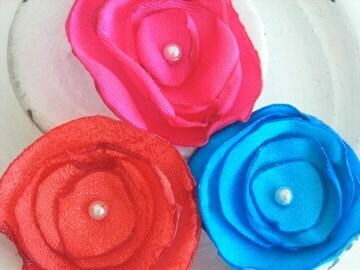 Three dainty 1" satin flower bobby pins in this spring's hot colors of turquoise, coral and fuschia. Wear them together or one by one, in a fancy up 'do, or with casual ponytails. So very pretty. 7. Become Dana's Facebook fan. Comment back here with your Facebook name. Existing fans just leave your facebook name here. 8. Follow Dana's blog. Leave a comment here letting us know you are a follower. If you are already a follower, leave a comment anyway, as each comment is an entry. 9. Follow Dana on twitter. Comment back here with your Twitter link. Existing followers just leave your Twitter link here. Contest ends Saturday, February 6, at 12:00 noon Central. One winner will be chosen by Random.org. Fun Friday Finds ~ Orange You Glad I Didn't Say Banana? 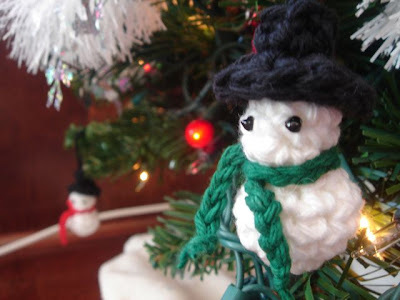 Congratulations to Jessica of Plushroom Soup for winning January's HandmadeMN monthly challenge! Thanks to all who participated in this month's challenge, and stay tuned for some great "Fiery" entries in our next challenge! Here is our featured HandmadeMN artist Kathy Van Schepen from Vantastic Designs where she creates a little of this and a little of that. You can also check Kathy out on her Blog, Twitter and Facebook fan page. 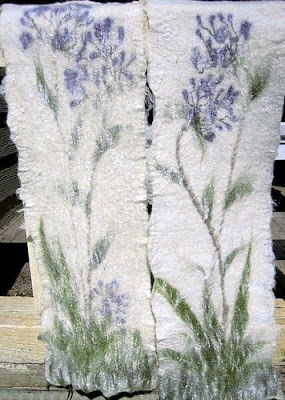 “The wall hangings were laid out with Merino wool roving which had been carded with a small amount of cotton. 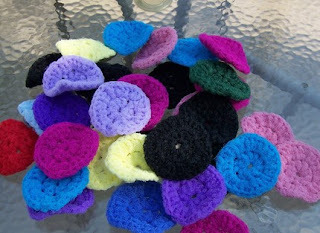 On top of the white roving I laid out the flowers that I had cut out from wool prefelt. The stalk is Ozark homespun and the leaves are Merino roving. On top of the flower display I laid a small amount of the white roving. I added a rod pocket on the back so they would be easy to hang. Then the fun began...warm water and soap to felt the design! A little muscle and elbow grease and the wall hangings were complete, just needed time to dry and they were done!" Now is the season of our dry winter skin. The cold, harsh wind makes us cry out for some relief, and my sanctuary during winter is none other than the bathtub. A nice warm soak is the perfect remedy to remove the chill from your bones. Your bath is drawn, the candles are lit. To make the experience truly heavenly would be some Sacred Suds. 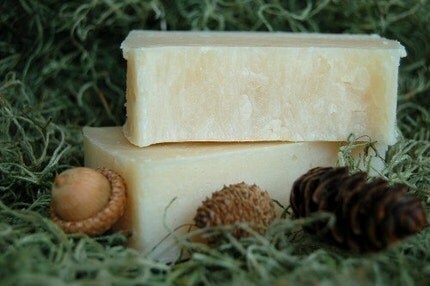 Andrea has concocted the most divine soaps to make your weary body come alive and to soothe irritated skin. Make no mistake, while I push these soaps during the harsh winter months of Minnesota, they are just as heavenly anywhere else on earth, in any climate. Aphrodite, Goddess of Love is a delicious mixture of rose, ylang ylang, and amber, along with rich oils to soothe the skin. As "rich and sensual as Aphrodite herself." Cernunnos, Celtic Nature God has been created to pay homage to a more virile and animal nature. 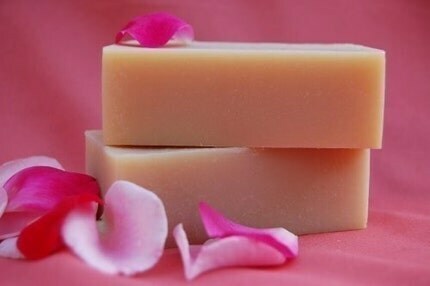 Scented with pine, fir, rosewood, musk, and clove, this soap will bring you back in touch with the natural being that you are. Shakti, Goddess of Creative Energy, a compilation of patchouli, ylang ylang, orange, and clove, will most certainly invigorate the senses as well as the body. 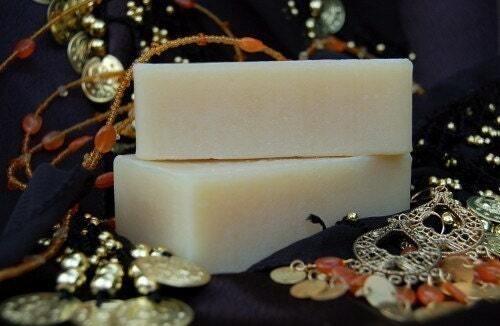 Go visit Sacred Suds and get the inside scoop on what could be the most luxurious soaps you have ever encountered. The shop is lovely and includes many glowing testimonials from those who have experienced the effects of these rich and beautiful soaps. 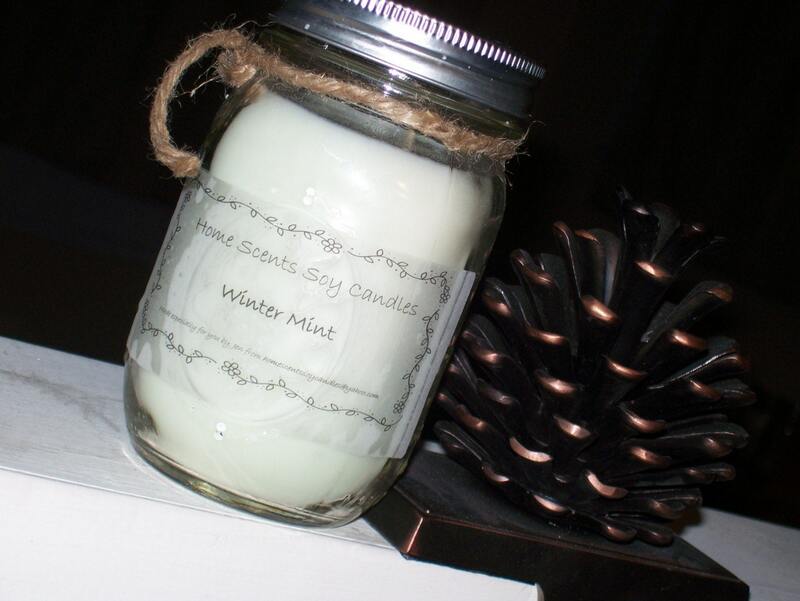 Also in the offerings are gift sets, as well as seasonal fragrances. Positively heavenly. Today we bring you this great set of personalized tile coasters from Ellie of Angel Ellie! The Fleur de Lis was the symbol of Kings representing purity, wisdom and honesty. 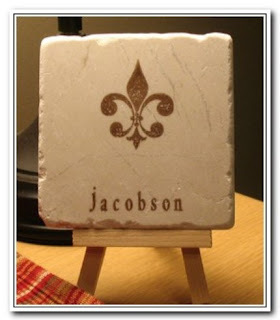 This set of 4 travertine tile coasters can be personalized with your first name or last. Each 4x4 tile has been hand stamped in brown. These are travertine tiles from Turkey. Ellie uses this specific type of travertine tile (ravini beige) because of their smooth texture with only minimal cracks and dents (mainly around the edges). They are strong and sturdy tiles that will last a lifetime. She hand stamps and hand paints each design. These coasters are absorbent, and the design is heat set in so the painted design will not smudge when wet will absorb moisture from your glass or cup. Each tile has 4 felt pads on the bottom so they will not scratch table top finishes. These coasters are not dishwasher safe and can be cleaned with a damp towel. 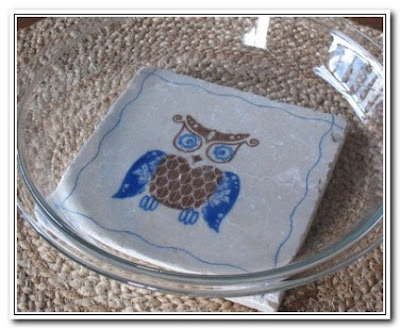 Add these hand painted tile coasters to your next party table setting for a special look and have the guests keep their tile coasters as a special party favor. 7. 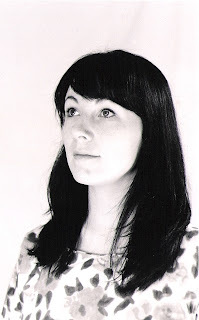 Follow Ellie's blog. Leave a comment here letting us know you are a follower. If you are already a follower, leave a comment anyway, as each comment is an entry. 8. Follow Ellie on Twitter. Comment back here with your Twitter link. Existing followers just leave your Twitter link here. Contest ends Saturday, January 30, at 12:00 noon Central. One winner will be chosen by Random.org. As we head into the second week of the New Year, I thought I would share some thoughts on goal setting. More specifically, goals for ETSY shops! 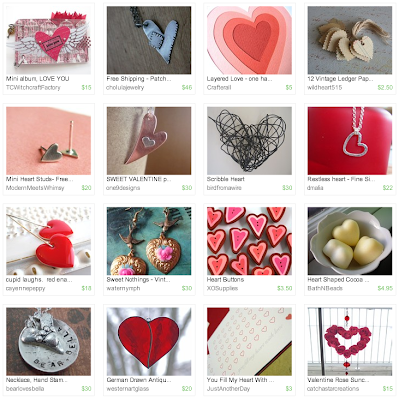 I opened RitasCreationsOnETSY in the spring of 2009. I didn't have a party or fire works or big announcements. Nor did I have much of a plan to move forward. Then in the fall of 2009 I opened a second shop, AndMoreBags, thinking I needed a separate storefront for my bags, purses, wristlets and snack bags – again, without much of a plan on how to move forward. As 2009 wound down, I started noodling about 2010 goals. I chatted with some fellow Etsians from Minnesota about how they handled 2009 goals. 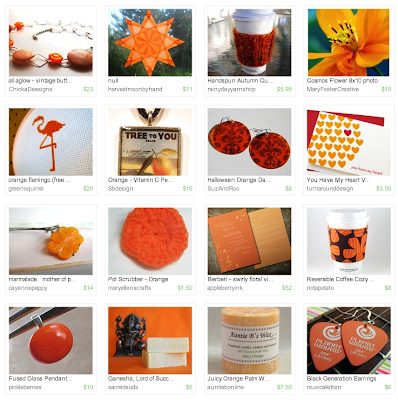 Suzanne Anderson of Suz and Roo set goals resulting in 50 ETSY sales! As a member of HandmadeMN, she feels the information she gets from this group is very valuable. 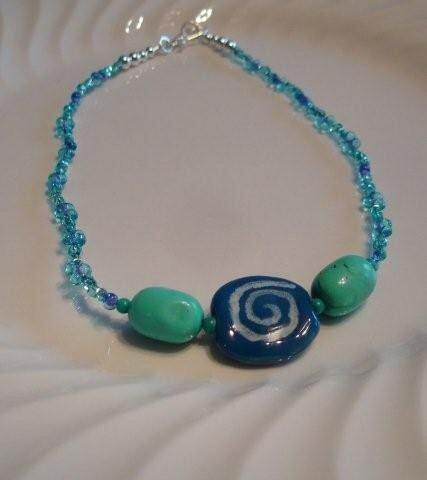 Her beautiful jewelry line was also popular at many local craft shows. Did you know that Handmade MN keeps a current list of shows that our members participate in? Courtney of Modern Meets Whimsy: Artisan Jewelry also set 2009 goals. One of her primary goals was to separate her stationery shop, Just Another Day, from her jewelry line. She listed or renewed items twice a day to get more exposure. The result: 120 sales during 2009! And what about 2010? Suzanne believes goals keep her on track and motivated. It answers the question “Am I successful?” Her goal for this year – 100 sales. How will she achieve this? The answer: List more - Get more exposure - Do more wholesaling. Courtney believes goals “are a great way to stay focused. Through goals you can visualize where you want your shop to be in the present, in the long run, and how to get there.” Courtney plans to create collections with different price points to build a core of repeat customers! 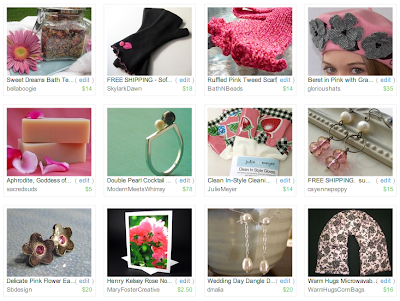 -To maintain exposure to my shops, list or relist 5 items weekly in each of my shops. -To stay sane, keep a good inventory of product. 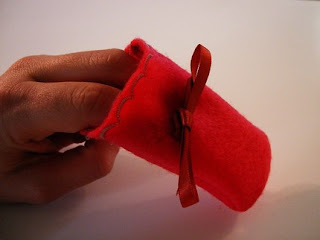 -To stay connected with my ETSY teams, participate in a team sponsored event at least once a quarter. -Between the 2 shops, I had an average of 13 sales each quarter in 2009. In 2010, double that in 1Q, triple that in 2Q and 3Q, and quadruple that in 4Q. That will be over 150 sales during 2010! So there it is - my goals for 2010! Do you have your goals set? You know it when it's here. 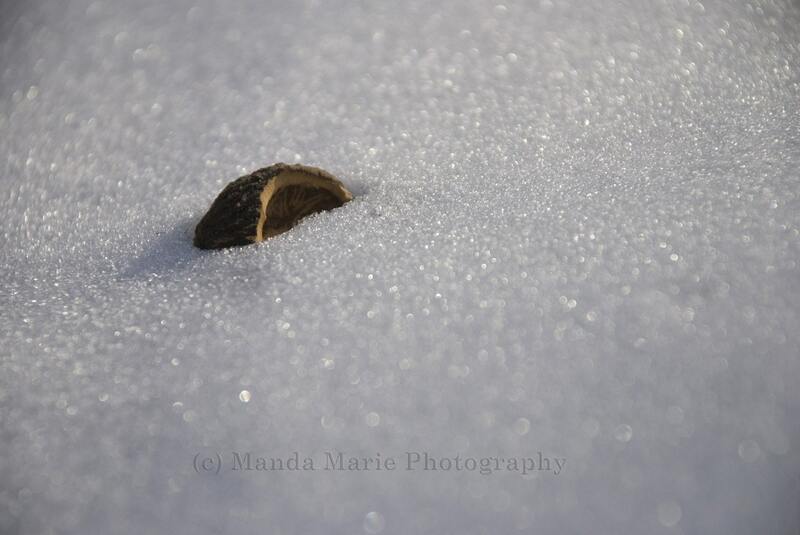 It could be the grinding, squeaking, crunch of frozen, sub-zero snow beneath your feet. Perhaps the shocking intake of breath when you first step out the door and gulp in that icy oxygen. Or the feeling of fingertips gone numb and raw from seconds of exposure. It's really cold. But you already knew that. 1. "It's Always Sunny in Philadelphia"
A friend got me hooked on this show a few months ago, and now I can't stop watching. I'm especially smitten with Charlie and his antics, and have the "kitten mitton" infomercial down by heart. I even bought a pair of these handy feline paw silencers from fellow HandmadeMN crafter, regan's brain, as a Christmas gift for a friend. My friend loves them; the cat is not so sure. Check them out in her shop! Maybe it's cliche, but sometimes there's nothing better than warm, comforting, chocolately, milk. 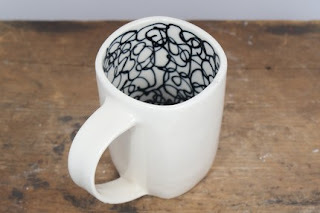 I'd love to hold some in this mug I've been coveting from HandmadeMN member mepottery. I love how the scribbles will become revealed as you sip your yummy drink. Check out her shop to see the whole "scribble" line. 3. Ironic, quirky, cold weather events. A friend relayed this experience to me: As she got into the car one morning, her coffee sloshed out of her mug, and right onto the steering wheel. Rather than spilling onto her lap, it froze solid onto the steering wheel immediately - no need to change outfits and be late for work! Ha. However, she did need to scrape off "iced coffee" from the wheel for the remainder of her drive. For those other hard to clean spills, try these fun pot scrubbers from Mary Ellen's Crafts of HandmadeMN. They come in a rainbow of bright colors; see them all in her shop. Me: (with skeptical look on face): "What?" Me: "No, I don't know hoarfrost." As I didn't believe her, she got out her trusty dictionary to confirm that hoarfrost is actually the term to describe "frost whitening the surface on which it is formed". What do you know? 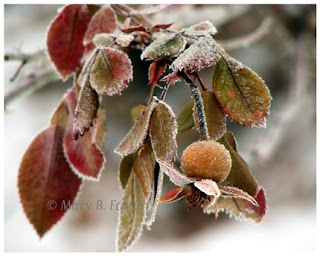 This gorgeous photo from Mary Foster Creative captures a lovely frost on a rosehips plant. See more of her photos at her shop. Well, I'm sufficiently warmed up, and I hope you are too. These winter days aren't so bad, and, as a bonus, they make us look tough. I'd love for you to leave a comment about what makes you smile during these cold, dark days. 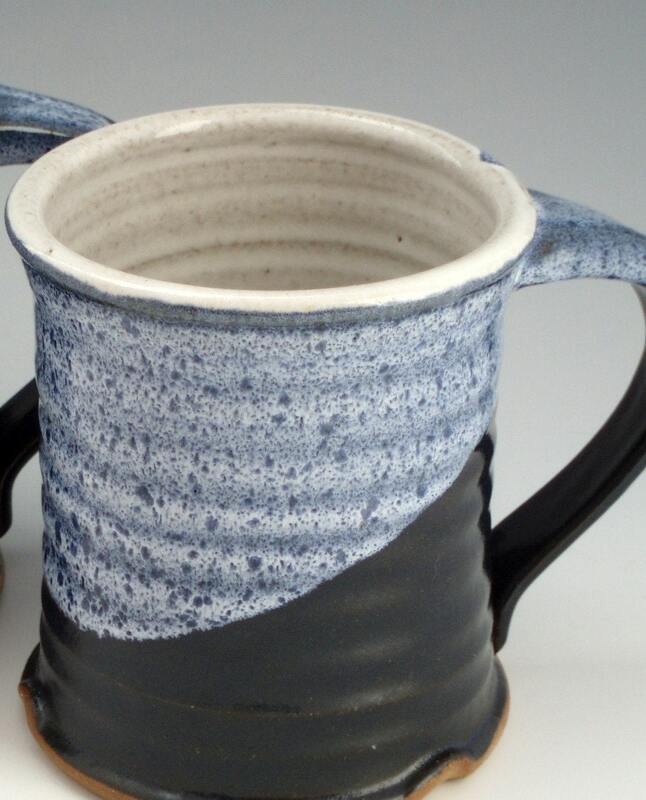 Today we bring you this awesome wheel thrown mug from Sue Pariseau Pottery! This stylish handmade mug has been wheel thrown from stoneware clay and glazed with a sapphire blue and glossy white combination of glazes. Mug is white on the inside. On the outside overlapping the sapphire and white glazes creates the lighter blue color on the top portion of the mug. This mug holds 16 oz of your favorite beverage. The stoneware and glazes are non-toxic, making this mug food, microwave, oven and dishwasher safe. I recommend using a mild dishwasher detergent which is better for your dishes and the environment. 7. Become Sue's Facebook fan. Comment back here with your Facebook name. Existing fans just leave your facebook name here. 8. Follow Sue's blog. Leave a comment here letting us know you are a follower. If you are already a follower, leave a comment anyway, as each comment is an entry. Contest ends Saturday, January 23, at 12:00 noon Central. One winner will be chosen by Random.org. This is one of my favorite vegetarian dishes that is very tasty and full of good protein. Served as a main dish or with you favorite meat dish, its bound to be your new vegetarian favorite! Combine the lentils and water. Bring to a boil, reduce heat, cover and cook for 20 min minutes, or until the lentils are tender but still firm. Drain and set aside. In a small bowl, combine the Braggs, honey, vinegar add ginger, mix well and set the sweet and sour sauce aside. 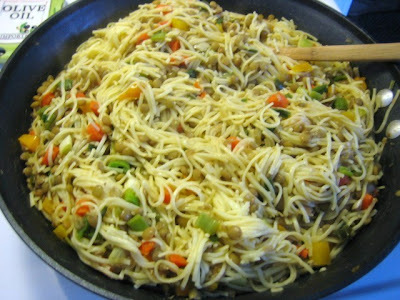 Cook noodles al dente (watch them carefully because they cook very quickly), drain and set aside. Heat the sesame oil over medium heat in a large skillet. When it is hot, add the garlic and carrot and sauté over moderately until the carrot is tender crisp. Add the green pepper and onion and sauté just until the onion wilts a bit. Now we need a tile trivet to set the vegetarian hot dish on. Visit Angel Ellie's shop for some fun trivets! Today we bring you this awesome purse from Stena of Crazy Busy. Check out Stena's shop on Etsy for more great bags, scarves and artwork! This bag is for the everyday angel and devil in all of us. It was created using an old pair of denim pants and a tie for the handle, and has a heavy duty snap closure just behind the original pants button. The Stafford tie is hand sewn to the bag and is extra long. This purse has 5 exterior pockets, and is embellished with an angel/devil patch and a small charm which was specially made for this bag! Stena has also included a mini Capri sun business or credit card holder and a larger Capri Sun bag. The card holder is lined with orange fabric, and has a velcro closure. 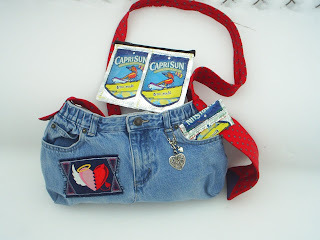 The larger Capri sun bag is made from 4 pouches zigzaged together and has a zipper closure. 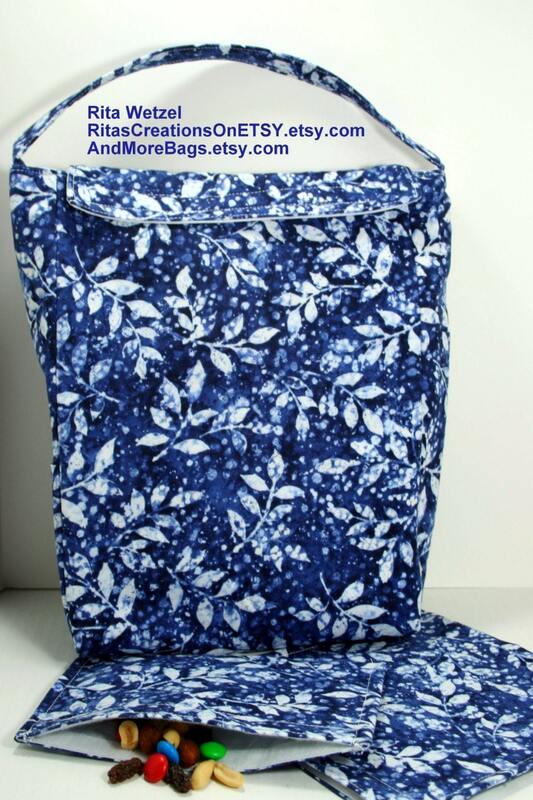 This unlined bag has a place for all of your treasures! Contest ends Saturday, January 16, at 12:00 noon Central. One winner will be chosen by Random.org. This month's challenge theme was "Winter". Check out the great entries below, then scroll all the way to the bottom to vote for your favorite! The winner will receive an advertising spot on our blog. Voting ends at midnight on January 17. Make 2010 a HandmadeMN year! 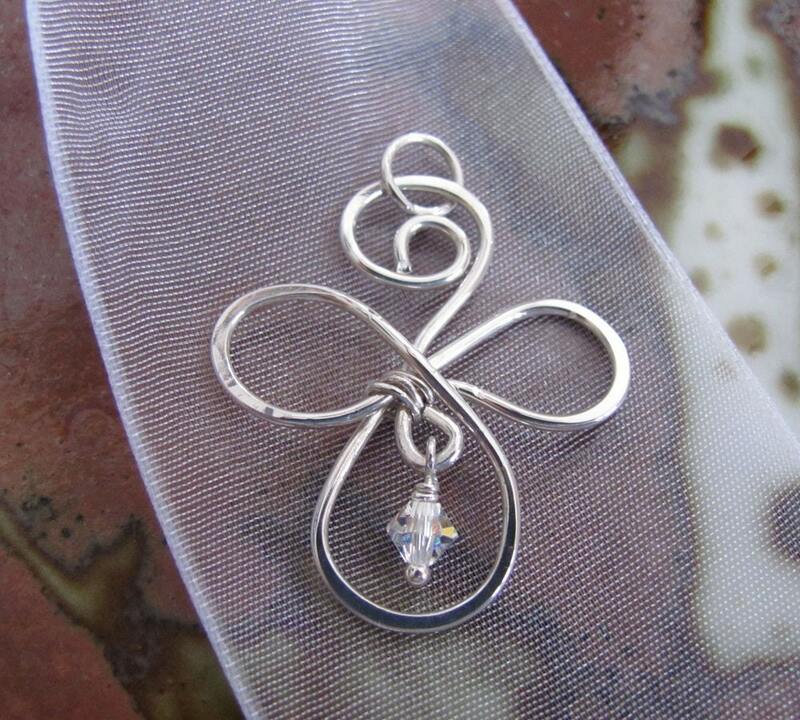 Sarah Bober - SB Design - Jewelry specializing in resin and fine silver designs. 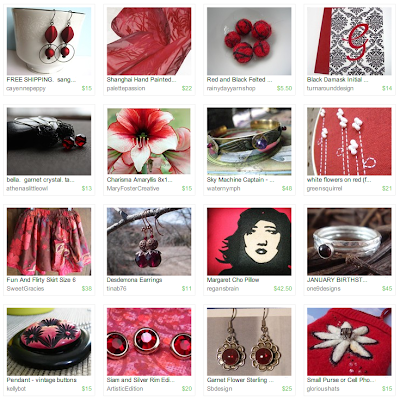 YazBerry Fashion - Vintage inspired clothing, purses & jewelry.